Orbit Downloader is a free download manager for Windows operating system without ads. Besides, it can also be used to download video/music/streaming media from Myspace, YouTube, Imeem, Pandora, and Rapidshare. However, in spite of being an ads free download manager, by default it will hijack all 404 error pages in your browser, by redirecting the pages to orbitdownloader.com search page. Maybe it is a good feature that you might like, but it is not for me. Fortunately, Orbit Downloader allow you to disable this feature, as depicted in Figure 1. 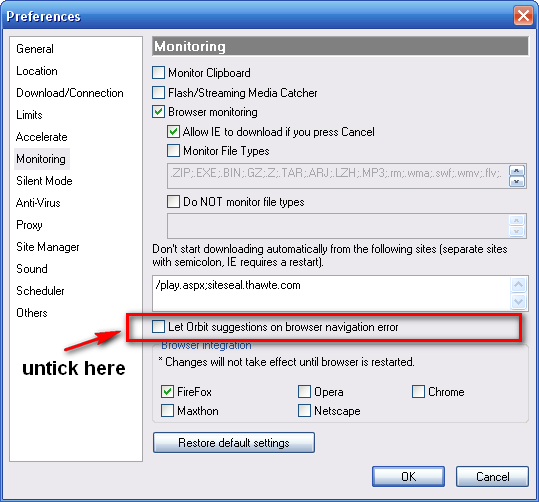 Open Orbit Downloader windows, from the Start Menu, or by double clicking its icon in the system tray. Click on Tools > Preferences > Monitoring. Untick "Let Orbit suggestions on browser navigation error".